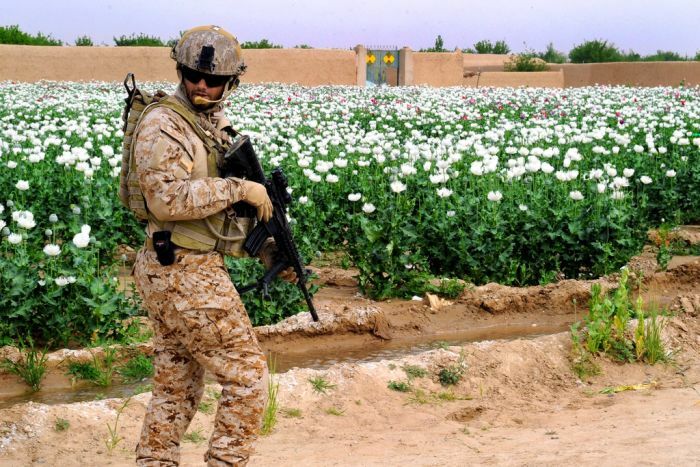 Americans have been over a decade in Afghanistan, and no one has ever seen anything leave a poppy field and move out of the country to a heroin processing plant. In ten years. The comment is sardonic, of course. The Taliban had the poppy crop under control before the Americans arrived, and since that invasion in 2001, new records are set on a regular basis. The US claims to be trying to stem the flow, but this is a lie. The US is there to protect the fields, as the drug money is an important part of covert operations for intelligence agencies. It ends up in Wall Street banks, London, you know, with the cocaine snorting set, as opposed to crack users, who often land in jail. War on drugs, you see. Don’t kid yourself – the US is not involved in a war on drugs. Afghanistan, probably Mexico and Colombia too, are wars for drugs. That’s your country, folks. That’s what the boys are fighting for.